Articles in the Danish newspaper Jyllands-Posten (translation available here) and in the Irish Times both ran headlines claiming that another grand solar minimum could potentially trigger an "ice age" or "mini ice age" this century. These articles actually refer to the Little Ice Age (LIA) – a period about 500 to 150 years ago when global surface temperatures were about 1°C colder than they are today. 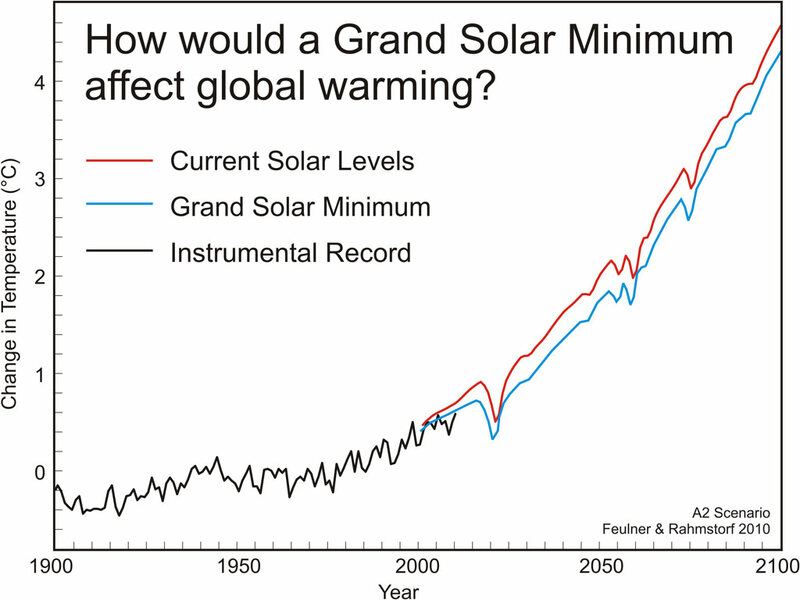 Thus a grand solar minimum would have to cause about 1°C cooling, plus it would have to offset the continued human-caused global warming between 1 and 5°C by 2100, depending on how our greenhouse gas emissions change over the next century. There have been several studies in recent years using climate models to see what impact another grand solar minimum would have on global surface temperatures, since solar research suggests it's possible we could be due for another extended minimum. Feulner & Rahmstorf (2010) (PDF available here) estimated that another solar minimum equivalent to the Dalton and Maunder minima would cause 0.09°C and 0.26°C cooling, respectively. Jones et al. (2012) (PDF available here), Anet et al. (2013), and Meehl et al. (2013) (PDF available here arrived at nearly identical results, with cooling from a grand solar minimum causing no more than 0.3°C cooling over the 21st century. Meehl et al. also point out that as soon as solar activity began to rise again, that cooling would be offset by solar warming. This is a key point, because a grand solar minimum would not be a permanent change. These minima last for a few decades, but eventually solar activity rises once again. Thus any cooling caused by a solar minimum would only be temporary. The cooling effect of a grand solar minimum can also be estimated very easily without the aid of climate models. To see the calculation, check the Intermediate level of this myth rebuttal. Also see this excellent video by Peter Sinclair of Climate Crocks debunking this myth.